Well, you shouldn’t be. There is a working method you can use to bypass the Hulu anonymous proxy error and access its massive library easily. Before you learn how to fix Hulu proxy error, you may probably want to know the reasons why you are getting the message. For starters, Hulu is a US-based streaming service which is why the service isn’t available anywhere outside the US. If you try to watch Hulu from outside the US, you will be barred from accessing its content. Some users have anonymous proxy tools installed in their systems. Although you might be using the tool to protect your online activities against any unwanted surveillance such as spying, you might also be violating Hulu’s terms and conditions. Therefore, you may need to uninstall or disable the proxy tool to bypass the error and access Hulu. Or, you may also look for any exception feature in the tool and add Hulu to its exception list. Commonly, ISPs assign shared IP addresses to its users. Often, such IP addresses get blacklisted, for instance, when any user tries any inappropriate activity or use any banned tool on that IP. So, if the ISP reassigns the blacklisted IP, the user may get the proxy error when accessing Hulu. The common workaround to the problem is to report the ISP of any possible blacklisted IP and request them to reassign you a whitelisted IP. Another common reason behind the error is an unsupported device or third-party application. Hulu can only be accessed through its official app. As a result, the streaming service would immediately pop up an error on your face when you try to access it via an unsupported 3rd party app. Apart from the app, you need to access the Hulu app on a mobile device or OS that it supports. Finally, one of the most dreaded reasons behind the Hulu proxy error is a virtual private network (VPN). There’s no doubt that VPNs offer the best encryption and anonymity, allowing users to hide their Internet activities and secure their data against hackers and other cybercriminals. However, streaming services like Hulu and Netflix aren’t that fond of VPN services. Consequently, such streaming services have barred many VPNs from accessing their content gallery. Therefore, if you are using a VPN and getting the error, it means your VPN doesn’t offer Hulu or Netflix accessibility. Luckily for you, PureVPN is the best VPN to watch Hulu. It equips you with a plethora of anonymous IPs that can help you fix Hulu proxy error and give you instant access to its massive library. We know now the common scenarios that may lead to the annoying Hulu proxy error. Now, without further ado, let’s learn how to fix Hulu proxy error in a few simple steps with PureVPN. 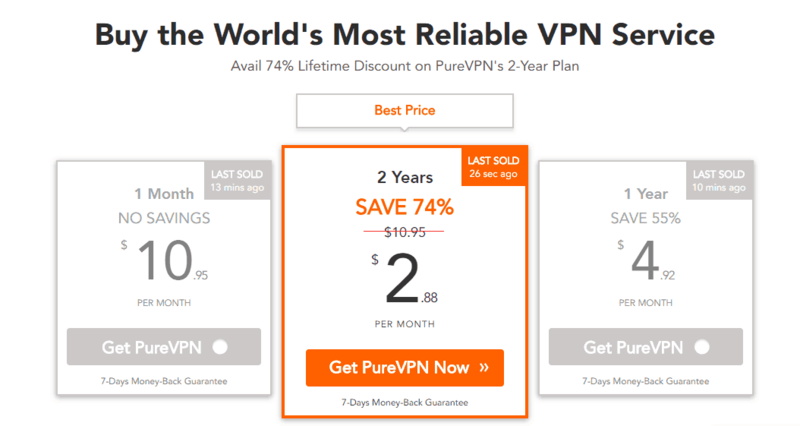 PureVPN is amongst a rare few VPN services that offer complete access to Hulu, Netflix, and 100+ other streaming channels. To get started, choose a plan that best suits you and subscribe to PureVPN. The 2-year plan is the most recommended deal because it liberates you from re-subscribing for another 24 months. The extension gives you the convenience of connecting to the VPN on your browser and accessing Hulu. For the convenience of users, PureVPN has created a shortcut to servers that let you enjoy your favorite streaming services. With a single click, you can easily connect to a server that supports Hulu. So, connect PureVPN on the browser extension, go to Popular Websites and connect to Hulu US. The moment you click Hulu US, PureVPN browser extension will connect you to a Hulu streaming server and takes you directly to the Hulu website. Now, enter your Hulu credentials and enjoy Hulu’s massive gallery on your browser. Why is Hulu So Popular? Hulu doesn’t need any formal introduction because it is a popular competitor of Netflix when it comes to online streaming channels. The streaming service is the result of the collaboration of 3 big news media channels: NBC, FOX, and ABC. The aspect that makes Hulu a fierce competitor of Netflix is its vast gallery of live TV/sports channels as well as movies. Currently, the service boasts over 50 popular channels and hundreds of thousands of movies. In fact, the Emmy-award winning TV series, The Handmaid’s Tale, is Hulu’s original TV show. Apart from that the convenience of watching your favorite movies or TV shows on the go is what that adds to the popularity of the service. Why Do You Need a VPN to Watch Hulu? Just like Netflix, Hulu needs a distribution license in other countries to stream its content. Currently, Hulu only has the distribution license in the US alone. As a result, users who are living outside the US , can’t access Hulu even if they have a Hulu account. For instance, if a US user is on a vacation abroad, they won’t be able to enjoy their favorite Hulu shows abroad. So, how do they access the channel from outside the US? Here, a VPN comes into the picture. A VPN allows users to mask their real IPs with a US (or any other location) IP. Consequently, when they connect to the Hulu server, the server lets the user access Hulu believing that the user is from the US. If you don’t want to miss out on your favorite TV series or movies on Hulu, you may want to follow the steps mentioned here to bypass the Hulu proxy error and access its massive gallery. This I should not have to buy an additional monthly app to,use Hulu in US location. Please provide an alternate free access option when I am traveling in the US! You may not need a VPN when travelling in the US. PureVPN must be used to access Hulu outside of US. There is no other reliable free option.